God’s Warehouse in Albuquerque, New Mexico, is a ministry, placed in the heart of a red-light district, that looks to inspire change for the less-fortunate through acts of Christlike love. This nonprofit organization has been responsible for transforming the lives of the homeless community by providing limitless compassion for each person in need of their help. How did this amazing ministry begin? With one man and one organization. Pastor Chuck Aragon, an ex-con who found Christ through his time in prison, wanted to share the transformative power of love and the heart of God. He dedicated himself to working with New Beginnings Church of God, which led him to an amazing opportunity. Duke City Toolbox, a Methadone clinic, saw potential within Pastor Chuck. As a federally funded organization, they were unable to incorporate a spiritual element into their process for transformation, but they also knew how important a spiritual element is to the experience. The organization cut a deal with Pastor Chuck—they would rent out the warehouse located close for one dollar a year. This led to the birth of God’s Warehouse. Pastor Chuck (left) with others ready to help God’s Warehouse give back to the community. From there, Pastor Chuck worked tirelessly to build this ministry into something that would reach out to the struggling community around. God’s Warehouse dedicates itself to serving the homeless community and showing God’s love by through hot meals, fresh clothing, and spiritual transformation. Despite having an initial emphasis on the homeless population, they have extended their reach to anyone struggling within the surrounding red-light district. Locals of this area have designated this as the “War Zone.” With all the odds stacked against the ministry, they have persisted time and time again. They continue to see lives transformed for the better and to provide love for all who come to their doorstep. The ministry has been blessed with many successes for both the community and the people who help through working there. These disadvantaged come forward to God’s Warehouse and look for help during their time of need, and through the limitless amount of perseverance from both sides, these broken few emerge restored. Sometimes they even leave as couples to become families once they re-enter society. One of the beautiful parts of this is that these same people often come back to help serve at God’s Warehouse. Being filled with the love of Christ and the heart of God, these same people want to share the transformative power that God’s Warehouse has to offer. Hot meals for the homeless are just one aspect of the ministry. 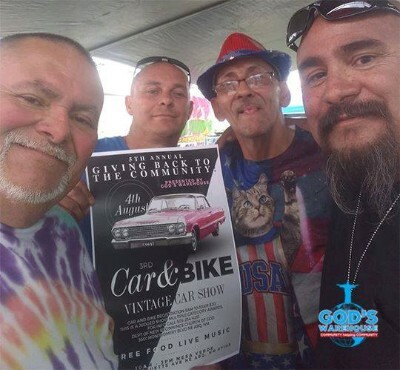 God’s Warehouse has become filled with far more than just the people looking for help, but it also has become a place for other ministries to share the love of Christ. The individuals who come to serve their fellows gather from all different backgrounds with the sole motivation of love. For God’s Warehouse, love is the single most powerful thing that unites all people despite what background they come from. This love is what has driven Pastor Chuck to seek help from fellow ministries, food pantries, and even some food companies in order to provide a life-changing experience. 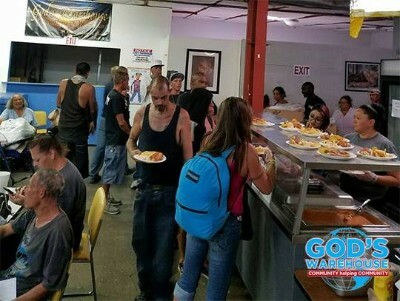 New Beginnings Church of God is encouraging gifts to help support God’s Warehouse via their GoFundMe page: https://www.gofundme.com/god039s-warehouse-abq. Thank you for your support. Lane Webb is a senior English major at Anderson University, also serving as a communication intern for Church of God Ministries. This entry was posted in All Church of God, Western and tagged Albuquerque, Charles Aragon, Chuck Aragon, city, clothing ministry, community, food pantry, God's Warehouse, homeless, hunger, Michael Romero, New Beginnings Church of God, New Mexico, NM, parachurch, Richard Mansfield, street ministry, urban, urban ministry, urban missions. Bookmark the permalink.